2. and still move in the direction of a life you value? Often, we feel like we have to "get over" all these things inside -- fear, loneliness, inertia, rejection, pain, etc. -- before we can go out and pursue the life we value. For example, feeling sad might make me want to hide away from friends & family until I feel better... even though relationships & community are important to me. Or, being afraid that no one will like my work can lead me to stop working on creative projects... even though art & creativity are what I enjoy. Traditional psychological approaches would focus on changing those troublesome feelings, thoughts, or fears: "Maybe, somehow, if I could think differently, or control my feelings, I could move beyond where I am stuck." our Real Life may forever be on hold. In other words... can you be filled to the brim with self-doubt, and still choose action towards your dream? Can you notice unhappy thoughts about your weight, and still nourish yourself? Can you feel bogged down by a chronic burden, body or mind, and still go out into the sun (or whatever it is that makes your heart sing)? And the point is, to feel everything. 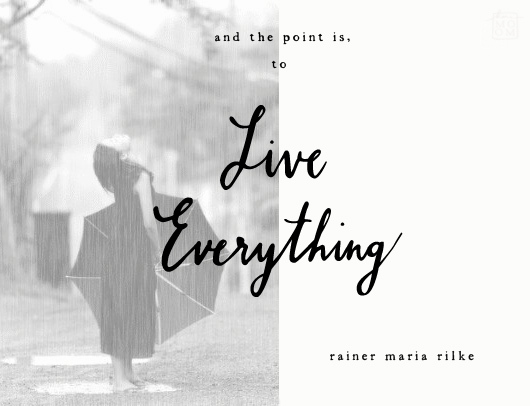 And to live everything. This post is part of a series on Acceptance & Commitment Therapy, where I share bite-sized concepts from my training and how they relate to everyday life, wellness & creativity. I will write more on values & language in the days to come. Please let me know any comments & suggestions you have! thank you claudia for the encouraging little note :-) i appreciate you stopping by & do hope you stick around! This is exactly what I needed to think about this morning. Thank you for the thoughtfulness. darci, how great to hear this has given you some food for reflection. if you have any follow-up thoughts or questions, feel free to let me know!